School Library Journal - 03/01/2015 PreS-Gr 1—When elephants Ann and Bess play school, Ann makes it quite clear that younger Min is not welcome. "'This is a school zone Min….Here is the line,' said Ann. ' You may not step over it.'" Clever Min is not deterred. She promptly begins gathering materials—board, rocks, a big tube, a rope, and a helmet. Before long, Min has engineered a rocket with a seesaw delivery system (Wile E. Coyote-style) that, much to Ann's dismay, takes her right into the school zone. "'Hi!' said Min. "I didn't step over the line. I flew over it.'" The text uses contractions, simple words, and also some challenging terms such as "scientist." The pen and ink with watercolor illustrations clearly depict the action and follow the text. They provide just the right amount of detail, expression, and white space to help new readers along. VERDICT This easy reader is sure to be well liked by siblings, regardless of their birth order.—Catherine Callegari, Gay-Kimball Library, Troy, NH - Copyright 2015 Publishers Weekly, Library Journal and/or School Library Journal used with permission. 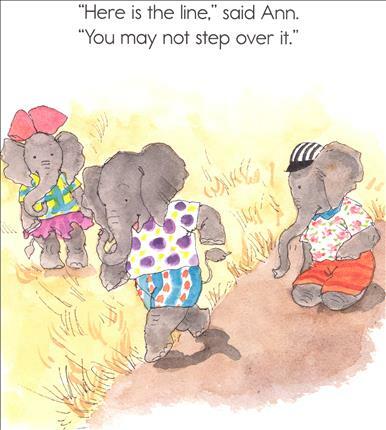 Booklist - 05/15/2015 Elephants Ann and Bess are playing school when Min attempts to join them. “This is a school zone, Min,” says Ann. “School is hard. You are not ready.” Ann then draws an imaginary line around their play area, informing Min, “You may not step over it.” Undeterred, Min pursues a project of her own—designing, constructing, and flying a working rocket that propels her into the play area. “Hi!” says Min. “I didn’t step over the line. I flew over it.” McCully’s latest contribution to the I Like to Read series (Little Ducks Go, 2014) features a kid-recognizable problem, sympathetic characters, and a humorously handled, clever solution. McCully’s signature pen-and-ink with watercolor illustrations appear throughout—some as inset drawings and others as double-page spreads. They convey every step of Min’s experiment and are positioned to assist beginning readers in predicting unfamiliar text. The large typeface (often placed against a white background) is also a plus. 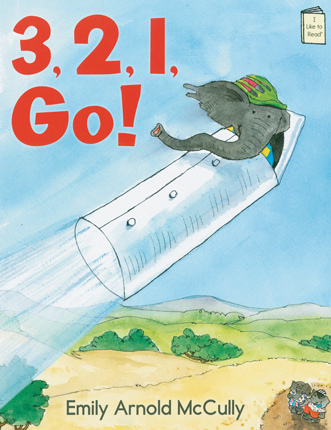 This succeeds both as entertainment and instruction; the pachyderms’ social interactions and STEM content are a delightful bonus. - Copyright 2015 Booklist.